This week’s theme for Sepia Saturday shows swans and carriages for a ball at Grace Bros , a department store in Sydney in 1930. There was another department store in Sydney called Farmer’s and through this contrived link we will find Hilda Tansey, daughter of Bandmaster Tom, working there in that same era. She was a cunning poker player, loved her budgie, had a great sense of humour and she was my aunt. She was also a fine player of brass instruments, conductor and teacher, and the first lady conductor of a brass band in Australia.. Her father began teaching Hilda when she was 6 years old and had to stand on a box to see the music on the music stand . She gave her first public performance in 1909 in Murtoa, playing a cornet solo at a school concert – “Songs we sing at School”, which had been especially arranged for her. 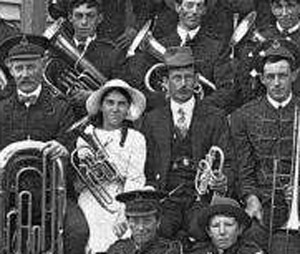 Soon she was playing with the band, and then with the Traralgon Brass Band, where she became first collector, then Secretary at age 15. 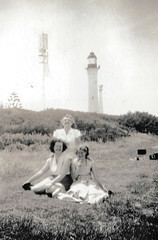 However by the early 1930s she was living in Sydney. 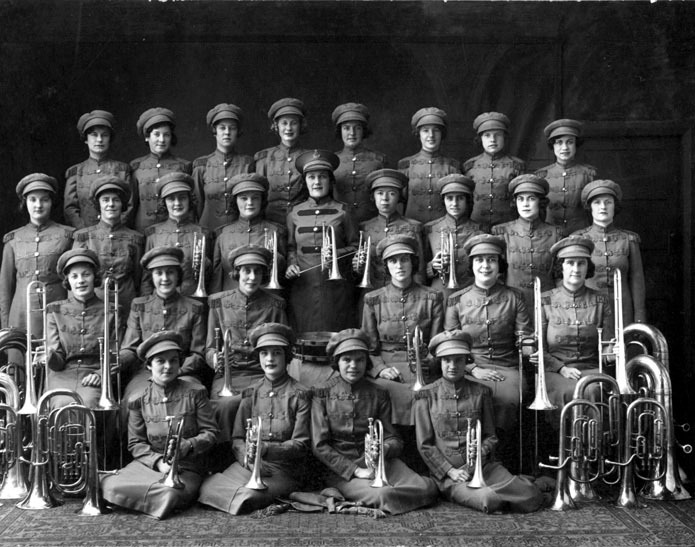 The Sydney Ladies’ Band had been formed in the early 1930s but by April 1934 the band was practically insolvent with debts of 107 pounds for uniforms and instruments. 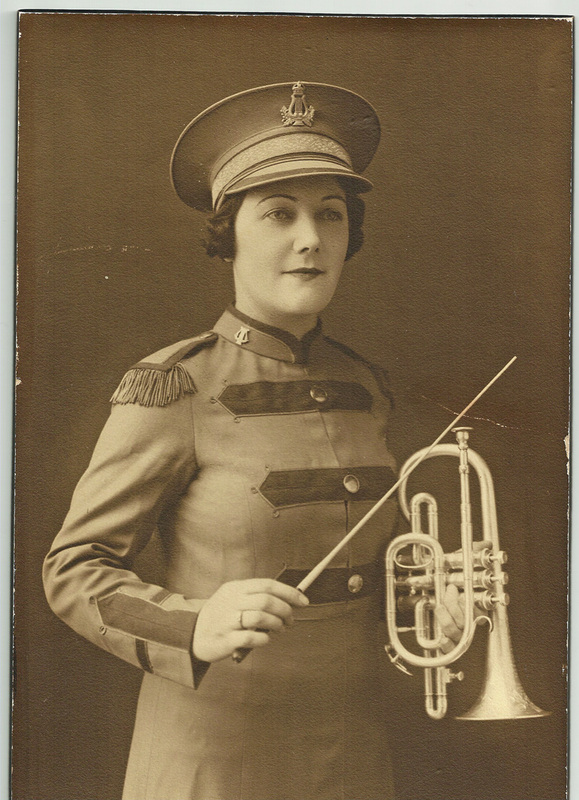 Hilda and ten other women players took over the debt and formed a new organization, the Sydney Ladies’ Brass Band, with Hilda as honorary conductor and teacher. She was working at Farmers at the time and hired a room at the bottom of George St near the Quay for practice at five shillings a week. 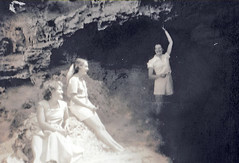 Other women joined until they had 29 members. Not all of them could read music when they started, or even play an instrument. Not a man in sight – all previous women bands had men involved in the training etc. 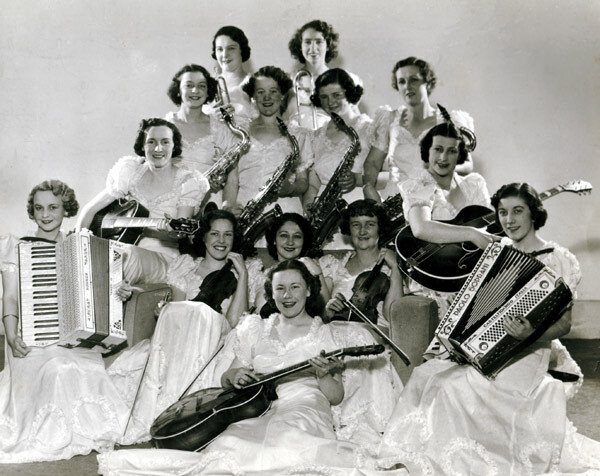 With the exception of some bass instruments and drums, each girl bought her own instrument, and they made their first appearance in a grand pageant on Gala Day, November 22, 1934. During their initial preparation and training period they raised 65 pounds through social functions, and by adding £35 from engagements and the remainder from the members’ contributions of one shilling per week, they had paid off the debt with which they started within four months of accepting engagements. They were very busy ladies. 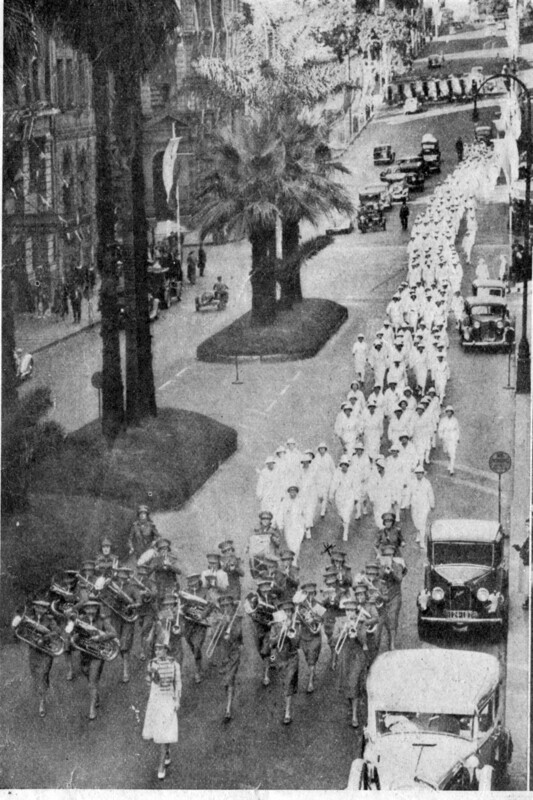 In April 1938 they led a parade of Red Cross Nurses through the city for the laying of the foundation stone of the building in Jamieson St which was to become the home of the NSW Division of the Red Cross Society. 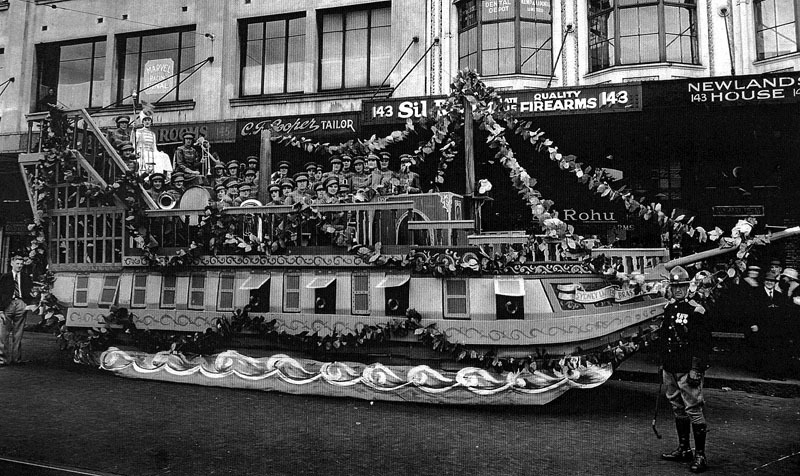 They played at the official opening of the Velodrome at Canterbury in 1936 and appeared regularly at Mark Foy’s store on Friday nights, as well as playing on beautifully decorated floats during parades and at garden parties. In their spare time Hilda and some of the others played in a ladies’ dance band at the Trocadero or as a filler between bouts at the Wrestling. Playing at the Trocadero. 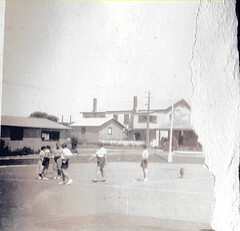 Hilda, back left. During the War years the band used to play for the troops at Liverpool and Ingleburn, and at the Showground. Unfortunately the R.S.L. 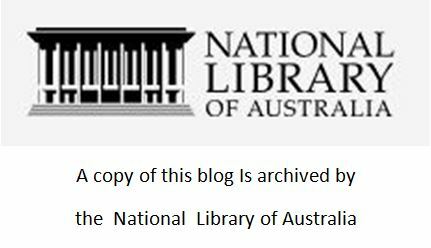 refused to let the band march on Anzac Day in 1945, and this was just one of the contributing factors to the members’ decision to disband. This entry was posted in Entertainment, Family History, Family Stories, History, Uncategorized and tagged 1938, conductor, Farmers, Hida, Ladies. Brass. Band. 1934, musician., Sydney, Tansey, Trocadero on November 29, 2014 by lazycoffees.